The following is another excerpt from my lecture at the Brooklyn Public Library. This was the introduction to the segment on color. Let’s talk about color. I try very hard to treat everyone equally. I try to approach people, whether familiar or not, without prejudice. But there is at least one instance I can think of in which I speak differently to someone, based upon their background… more specifically, where they are from. If, for instance, you are from New York, and you ask me how to get from The Port Authority to my apartment by subway, I will say, “Take the A-C-E to the L, and get off at the Lorimer stop. 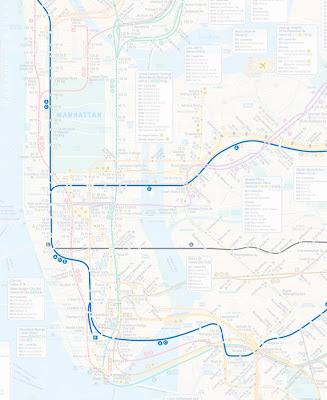 But, if this is your first time in New York, then I’ll make a simple substitution: I’ll say, “Take the blue line to the gray line, and get off at the Lorimer stop. By opening with this, I was hoping to convey the way in which I think about color — more of coding system that can be used in a very pragmatic manner. 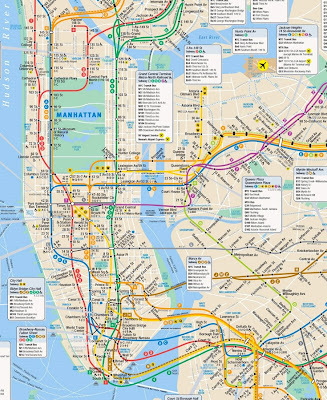 By the way, if you name the subway lines by color to New Yorkers, they will look at your funny. I need to get in touch with you the next time I come to NYC in a few weeks. That sounds ridiculously simple to understand. Last time I was there, I visited Donato in Brooklyn and had to make my way back to the Flatiron to visit Irene Gallo. That was quite the trip considering I had never navigated myself through NYC's subways system. Paolo, please create a simplified map for me. I can pay you in pretzels. The pretzels... are they chocolate covered? Of course, however the chocolate is cursed. It's worth it.